Scientists at NASA’s Goddard Institute for Space Studies (GISS) say 2012 was the ninth warmest year since 1880, continuing a long-term trend of rising global temperatures. The ten warmest years in the 132-year record have all occurred since 1998. The last year that was cooler than average was 1976. The line plot above shows yearly temperature anomalies from 1880 to 2011 as recorded by NASA GISS, the National Oceanic and Atmospheric Administration (NOAA) National Climatic Data Center, the Japanese Meteorological Agency, and the Met Office Hadley Centre in the United Kingdom. All four institutions tally temperature data from stations around the world and make independent judgments about whether the year was warm or cool compared to other years. Though there are minor variations from year to year, all four records show peaks and valleys in sync with each other. All show rapid warming in the past few decades, and all show the last decade as the warmest. 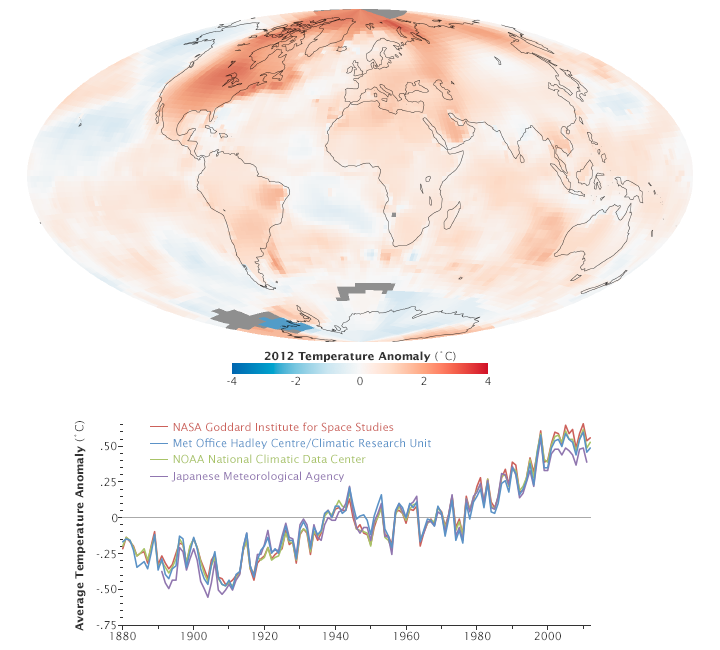 NASA (2013, January 15) NASA Finds 2012 Sustained Long-Term Climate Warming Trend. Accessed January 15, 2013. NASA Earth Observatory (n.d.) World of Change: Global Temperatures. Accessed January 15, 2013. NASA Goddard Institute for Space Studies (n.d.) GISS Surface Temperature Analysis. Accessed January 15, 2013. NOAA National Climatic Data Center (2013, January 15) State of the Climate: 2012. Accessed January 15, 2013. NASA images by Robert Simmon, based on data from the NASA Goddard Institute for Space Studies, NOAA National Climatic Data Center, Met Office Hadley Centre/Climatic Research Unit, and the Japanese Meteorological Agency. Caption by Patrick Lynch and Mike Carlowicz.